Unlike other road show providers, the road shows provided by Mesha Media take your message directly to your target audience…wherever they are across India,services provided by us can simply be termed as fabulous. Our aim is to provide world class services that will not cost a fortune. We hold expertise in organizing road shows, that can reach out to a large number of audiences and get brand ethced in minds of people. We organize road shows on behalf of corporate houses, personal brands and many more. Depending upon your event type and needs, we will pull together a dedicated team to deliver your roadshow events. Often led by a Technical Director or Project Manager touring with the roadshow, this event team has the unique combination of local knowledge backed up by our regional expertise. 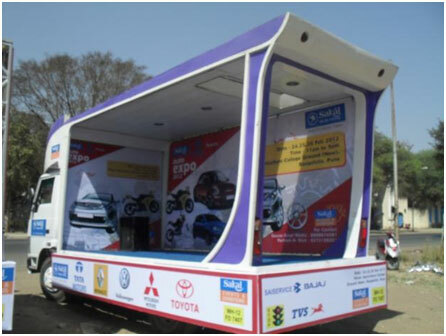 The complete execution of Road shows is done through Mobile Display Vans, Mobile Canter activities, Canopies, Kiosks installation, Human Banners, Mall Promotions, Market activations etc.